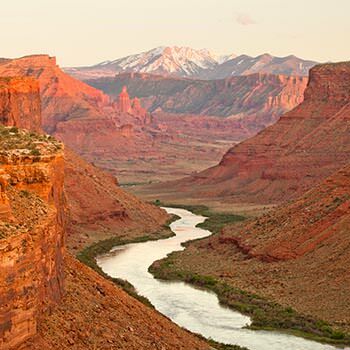 "The Moab, Utah Vacation Sampler in Moab was INCREDIBLE. The hummer ride, hiking, camping, and rafting were more than we could have ever hoped for. It was the trip of a lifetime for us. We couldn't have been more satisfied. In fact, our minds were blown over and over. :)"
This expedition was totally awesome. Each of the events were managed so incredibly well. All staff I met were great. This company goes over-the-top with service and fun. I can't wait for the next opportunity to go again. Ages 6 to 70 all loved it! Our family ranging in ages from 6 to almost 70 had a wonderful time on this trip. All of our guides were so friendly and helpful. There was just the right mixture of adventure and relaxation for all of us. The rafting trip was amazing, thanks to James, Scott and Jess who were great guides and cooks! We had some skeptics in the family before we left on the trip, but the Southwest Sampler quickly became their favorite part of a larger Western vacation. We are already looking at future trips with WRE. Our whole family had a great time. The guides were very professional and informative. The hotel was great. Our family (Patti, Pat, Kalli & Lexie) had a very enjoyable time on the Southwest Sampler Trip. Our guides were great on the rafting/camping trip. We had a nice group of people too! You guys should be very proud of your employees. They worked very hard were friendly, kind and really made everyone know that they cared about making the trip a great memory. Much thanks to Steph and Daniel. The e-mails I received in the months leading up to our trip were extremely helpful and perfectly timed. MOLLY IS AWESOME!!!!!!! She led both our Arches hiking tour and the Hummer ride at sunset, and she was phenomenal at both. I still can't believe how she handled that Hummer! Tiff and Jon were also awesome as guides on our overnight rafting trip. They could not have done a better job. Every activity we did with WRE was perfect - well planned, professionally led and totally FUN!!! All of the guides were amazing! Brian, Brian, Jon, Tiffany, Molly... we had a wonderful time and they were so incredibly nice and helpful! Website very informative, reservation process straightforward. The written information was very good; clear and easy to follow. We especially enjoyed Chris who drove on our hummer tour and was the lead on our river rafting trip. Stu and Lars were also very good, as well as McKenna and Emily. The staff overall are very impressive; organized, knowledgeable, capable and friendly. Very hard workers yet always taking the time to make the guests feel welcomed and entertained.I brought my two sons and my nephew on the trip and it was one of the best trips I've ever taken. I plan to return with my husband to repeat the trip! Molly, our hike and hummer guide was awesome!!! Friendly, informative, hilarious, well prepared - I could not say enough...highly capable, too. The river guides were also great - took care of everything. We felt very well taken care of the whole time. Good food, great tents, cots, bags, etc. An outstanding team from check in through to the guides on all the adventures. Access to information was easy and I appreciated the ability to call and reach a friendly person. The emails with preparatory information were very helpful.Super staff!!! The river guides made the trip memorable. Thanks for a terrific vacation. The guides were great -- best part of the trip because they made sure it all went well. I have already recommended your company to a friend. Molly was wonderful on our Arches trip. Then Molly, Brian and Stephen were great on the Hummer trip. Brian, Jon and Tiffanie were the greatest river guides!! That trip was fabulous and they did a wonderful job of taking care of all of us while on the river and then camping. Being able to sleep out under the stars was beyond words! The Southwest Sampler package was just right for a first visit to Moab. It showed us all the wonderful possibilities for a return trip! Western River sets the bar high! Western River sets the bar high for others to try and beat. Great communication for pre-trip planning. Guides John and Tiffanie were so much fun to be with and to share this experience. Molly was so delightful on Arches NP tour - so knowledgeable. Our HumV guide was Chris - so nice and great experience. The River raft was really awesome. Emily was our guide - so sweet and knew her way around the water. The river rafting was so much fun. The crew/food/organization/views - great. The whole experience was "out of my comfort zone", but I felt safe the whole time. All of your guides were outstanding and very knowledgeable in their aspect of the adventure, which helped put the experience over the top. Thank you very much. The pre-trip reminders and suggestion lists were extremely helpful. The guides were extremely knowledgeable, friendly, and, once again, could not do enough for us. This is my second excursion with Western River, and just like the first, was the trip of a lifetime! Our trip started off smoothly with great personalized customer service when booking it a few months ago. Then it continued with an out-of-this world combo of adventures! The sights were non stop, with awesomeness around every corner, and the crew was world class! Thanks to Molly, our Hummer driver Devon, and our rafting crew of Meg (go Canada), Buck (wild) and Brian (Master Chef).